The occult and metal have always shared a close relationship. Over the years, numerous band have incorporated themes of the occult and esotericism into their lyrical content and at times, even the music itself. Bands succeed more often in the former, than the latter, because attempts mixing occult themes with the song writing often end up sounding cheesy. 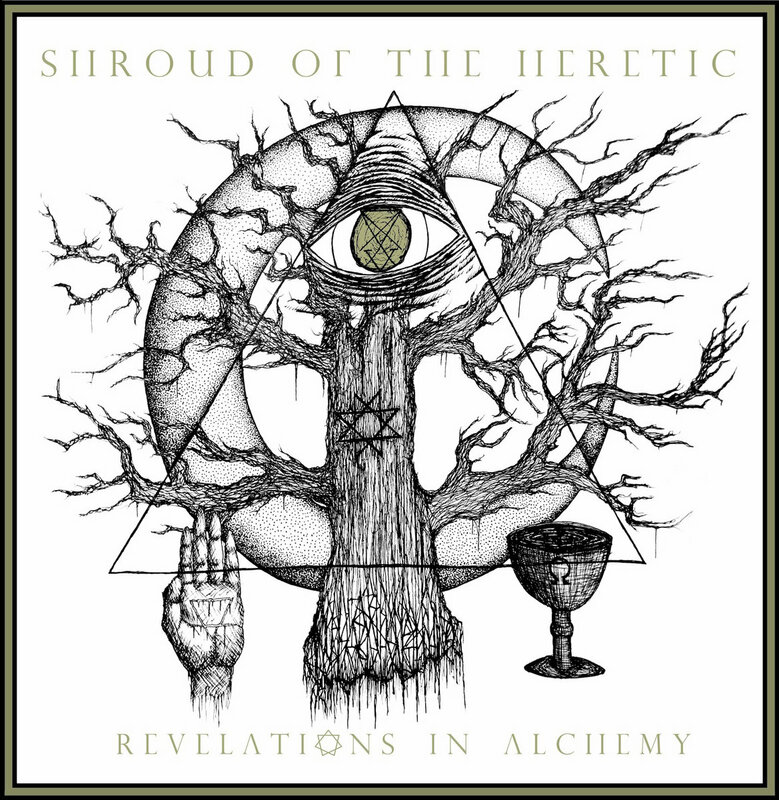 Shroud of the Heretic is a band that succeeds where most other bands fail, as they conjure up one of the most twisted and evil sounding record to come out this year. This three piece, hailing from Portland, Oregon, USA, play death metal that sounds very thick and muddy. They released their debut full length, titled 'Revelations in Alchemy' on 10th March, 2014 through Blood Harvest. On the outlook, everything about this band screams out darkness and occult. Be it the logo, the name, the record title or even the album cover, everything seems to have an dark touch to it. The band, with its music, backs up all such expectations created by it's appearance. One of the main factors that helps this band to make the music sound evil, is the dense atmosphere that is present throughout the length of the album. The raw production values too, suit the dark atmosphere. Song writing follows the old school method as the band's focus lies on creating riff after riff. Despite the rough tone and the dense atmosphere, these riffs that the band creates, are very memorable and have a tendency of staying with listener long after the album ends. The pace of the album is mid tempo to slow and it gives off a doom metal vibe. The patient pacing of songs and the long song lengths, do nothing to render this album boring. Infact, the album is quite entertaining (in a dark twisted way, ofcourse) from start to finish. The best comparison that can be made for this band, would be to call them a more darker and atmospheric version of Asphyx, except for the vocal delivery. The vocals here sound so grim and raw and it is quite indecipherable. The growls feel like just another instrument in the mix. Though it is difficult to ascertain what the songs are about (with all the indecipherable growling), judging by the track names and the music, there is a high chance that the band is singing (or growling rather) about the forbidden arts. There is nothing more that I can say about this album, except that this is one of the best releases to come out so far this year. It is a dark, twisted and memorable block of death metal that any person interested in death metal should listen to.